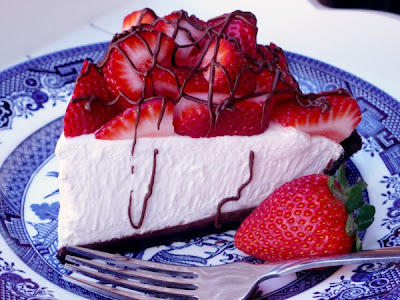 What could be better than strawberries and chocolate? 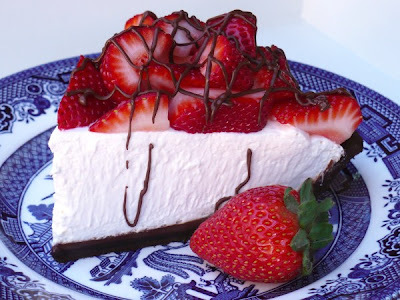 How about strawberries and chocolate AND a big, fluffy pile of creamy, dreamy deliciousness? Dude, this pie is so easy but it looks like a million bucks and tastes like it too. Do yourself a favor and make it NOW. 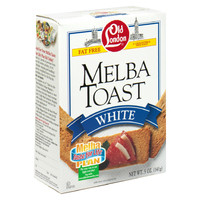 Combine 1 Tbsp. cornstarch, 2 Tbsp. sugar, cocoa, and dash of salt in a small, heavy saucepan; gradually add 1/3 cup milk, stirring with a whisk. Cook 2 minutes over medium-low heat. Stir in 2 Tbsp. chocolate chips; bring to a boil over medium heat. Reduce heat to low; cook 1 minute, stirring constantly. Spread chocolate mixture into bottom of prepared crust. Cool. In a large bowl, beat cream cheese until smooth and fluffy. Beat in sugar and vanilla until smooth. Add sour cream and mix well. Fold in Cool Whip. Spread evenly over chocolate layer (pie will be very full). Cover with plastic wrap and chill overnight or for at least 4 hours. Before serving, arrange strawberries on top. Microwave 2 Tbsp. chocolate chips with shortening in a ziploc bag on HIGH for 20 seconds. Knead the melted chocolate and shortening until combined. Snip corner off bag and drizzle chocolate over strawberries. I got the idea for this salad from a wonderful woman at my church. She brought something very similar to a get-together a couple months back and I haven't stopped thinking about it since. Apparently she just threw some things together that she had in her fridge. Wish I were that creative! 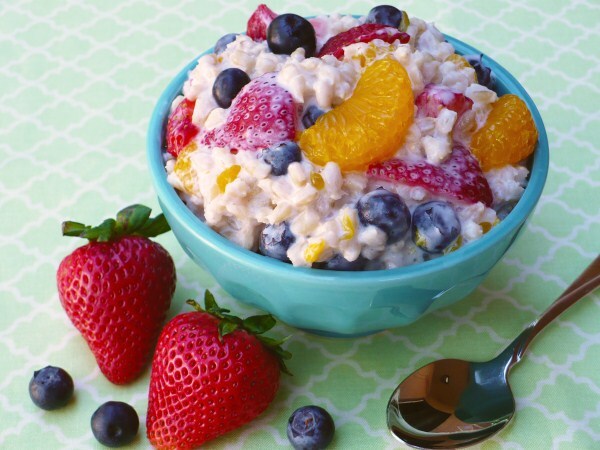 I use pearled barley in this recipe, which is not the same as the quick-cook variety. I'm able to get it in the bulk foods section of one of my local stores, but you can also buy it pre-packaged in bags or boxes. Look in the rice and beans section of your grocery store. By the way, barley is good for you but it is not gluten free. Combine barley, water, and salt in a saucepan and bring to a boil; reduce heat, cover, and cook for 45-50 minutes or until all the water is absorbed. Remove from heat and let cool to room temp. Fluff with a fork. In a large bowl, whisk together the yogurt, orange juice, brown sugar, and cinnamon, if using. Fold in barley and fruits. Chill until serving. Here is another recipe I posted back in June of 2010. Now that I have a nicer photo, I'm republishing it for those who haven't followed my blog for very long. This is such a great recipe, I don't want it to get buried by all my subsequent posts! This recipe came from my aunt Renee who passed away several years ago. She had many fantastic recipes (ex: Chinese Chicken Salad, Orange Jello Salad) and this was my favorite. The flavor is just amazing, especially if you let the meat marinate overnight. The recipe calls for flank or skirt steak, which are pricier cuts of meat. 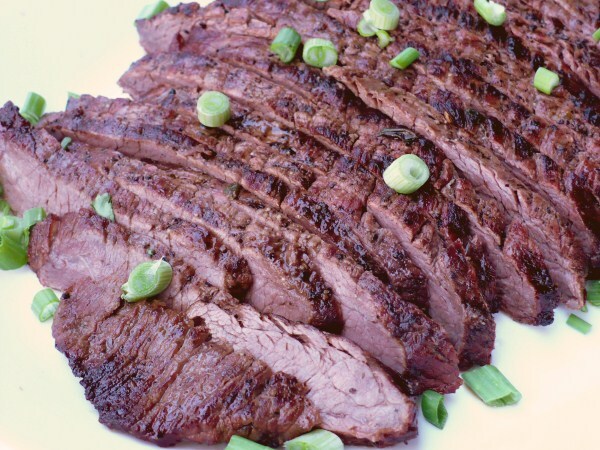 You can make it using a London Broil (or Top Round Roast), which is typically a cheaper but tougher cut of meat. To tenderize it, sprinkle it with some unseasoned meat tenderizer and then attacked it with a fork. Stabbing it voraciously (on both sides) seems to help break down some of the tough connective tissues. Marinating it for at least 3 hours (overnight is best) will help as well because the acid in the lemon juice acts as a tenderizer. In the photo the scoring on the left-hand side is a little too deep. You're going for very shallow cuts, less than 1/8 of an inch. I like to do it in a diamond pattern because it looks attractive. No matter which cut of meat you use, when slicing it for serving, ALWAYS cut against the grain. Here is a link to a short tutorial on slicing against the grain, if you're not sure what I mean. Also, once the meat has been grilled, let it rest for a few minutes before slicing. I usually put it on a platter, cover it with foil, and let it rest for 10 minutes. This gives the meat time to reabsorb some of the juices and will prevent it from drying out. However, you must realize that if you cook your meat to 'medium-well' or 'well done' that you are going to have drier meat. Here is a link to a site that lists grilling times for various cuts of meat. Combine marinade ingredients in gallon-size Ziploc bag and add steak. Marinate in fridge for at least 3 hours. Preheat grill to high heat. Remove steak from fridge and bring to room temperature. Grill for 1-2 minutes and turn steak. Reduce heat to medium and cook until desired done-ness, turning once. Remove to platter. Cover with foil and let rest 10 minutes. Slice thinly and against the grain. My husband was in charge of dinner for Mother's Day. He wanted to grill. I was down with that. I suggested marinating a flank steak (my next post) and he agreed. We don't have our own grill at the moment, but our neighborhood has a few small ones located here and there. He bought a bag of charcoal and I suggested that to get full use of the bag, we should grill more than one dish. Luckily I had some chicken tenderloins in the freezer and a recipe I wanted to try. We thawed out the chicken, made up the marinade, and soaked the bamboo skewers. I'm so glad we did, because these babies are delicious! Combine all ingredients except wedges in a gallon-size resealable bag and marinate in fridge for at least 1 hour. If using bamboo skewers, soak them in water as the chicken marinates. Preheat grill to med-high heat. 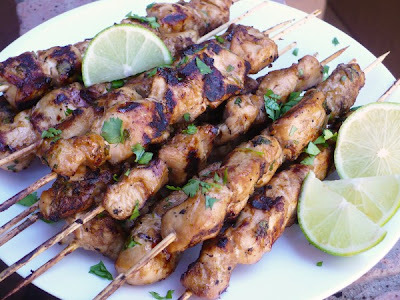 Thread chicken chunks on skewers. Grill skewers about 6-8 minutes on each side or until juices run clear. 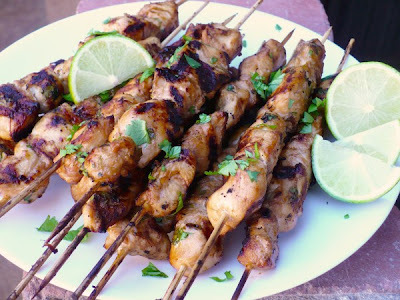 Squeeze lime wedges over skewers before serving. I just love pot roast. I'm a meat and potatoes girl. And maybe this makes me a non-gourmand, but I specifically love Golden Corral's pot roast. It's so tender and full of flavor. 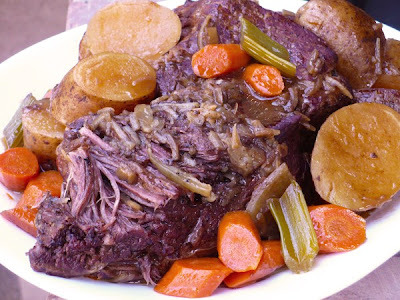 I've tried for a while to get my pot roast to taste the same but it always seemed to fall short until I tried this recipe recently. People, I have found my eternal pot roast recipe! We are going to be so happy together! Sprinkle roast with salt and pepper. Heat oil in a skillet over med-high heat and sear (brown) roast on all sides. Place roast in bottom of slow cooker. Return skillet to heat and add water, onion soup mix, brown gravy mix, and applesauce and whisk to combine. Remove from heat and set aside while you prepare the vegetables. Place vegetables around and on top of roast. Slowly pour gravy mixture over veggies and roast, being sure to get all potatoes covered with the sauce so they don't turn black as they cook. Cook on LOW for 8-10 hours*. Remove roast and veggies to oven-safe serving platter, cover immediately with foil, and place in a warm oven. Turn slow cooker to HIGH and whisk in some cornstarch mixed with water to thicken the gravy. Cook for 10-15 minutes or until thickened. Serve with roast and veggies. *I don't always get my roast ready in time to cook for 8 hours, so I usually cook it on HIGH for two hours or so and then reduce it to LOW for another four. I read somewhere online that you can put ripe bananas in the fridge and they will stay ripe for up to two weeks, even though their skins will turn brown. False. So now I'm sharing a recipe for banana bread. Luckily I ruined 3 large bananas, which gave me just enough mush for 2 loaves. 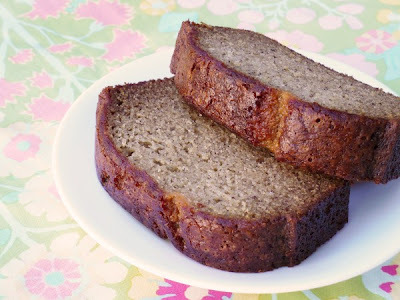 I've tried a number of banana bread recipes (my mom has one that is high-fiber, yet still yummy - go figure), but this one is my favorite so far. Preheat oven to 325 degrees. Spray a 9x5 loaf pan with cooking spray and set aside. In a large bowl, whisk together the eggs, buttermilk, and oil. Add the mashed bananas, both sugars, and vanilla and mix well. Beat in flour, baking soda, and salt just until mixed. Pour into prepared pan and bake for 1 hour or until a toothpick inserted in the center comes out clean (mine usually takes a little longer). Cool for 5 minutes, then remove loaf from pan and immediately wrap it with plastic wrap (I find this keeps it moist). Cool completely. *If, like me, you do not have buttermilk on hand, you can put a teaspoon of lemon juice or vinegar in the bottom of a measuring cup and then add milk to equal 1/3 cup. Let it sit for about 10 minutes before using. I originally posted this recipe back in October of 2009. I never liked the crummy photo that accompanied it and I finally decided to update it. I plan to occasionally update some of my older posts with new photos this year, but I'll still post new recipes as well. This recipe comes from my mom. 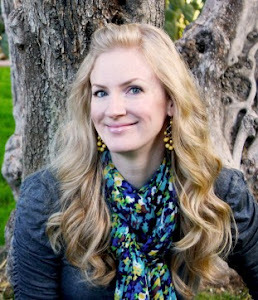 She grew up in Hawaii where you find a large mix of Asian cultures. Shoyu is the Japanese name for soy sauce. In a large pot, stir together the soy sauce, brown sugar, water, ginger, garlic, and sesame seeds. Add chicken thighs and stir to coat. Bring to a boil, reduce heat, cover, and simmer for at least 30 minutes, stirring occasionally. 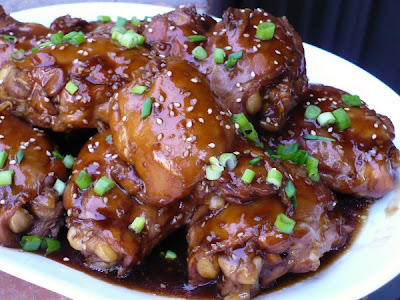 Remove chicken to a plate and whisk in cornstarch mixture to sauce; cook for another 2 minutes. Serve chicken with sauce over white or brown rice. Garnish with green onions, if desired. My husband is always on my case to try making more Asian food (I cannot for the life of me find a chow mein recipe I like). This recipe is touted as a copycat of P.F. Chang's Mongolian Beef. Since I've never had their Mongolian Beef, I have no idea if it's a perfect match or not. All I know is I really enjoyed it and so did my husband and daughter. And it's really not such a complicated recipe that I'll only make it once in a blue moon. Pretty much the only thing holding me back is the price of beef, specifically flank steak. Luckily my local grocery store had some thin-sliced beef for fajitas on sale, so I grabbed it and did a little dance of joy (please tell me I'm not the only one who does that). 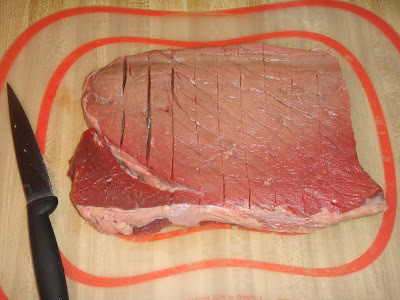 Whatever beef you use, you want to slice it thinly (1/4-inch thick or less) and against the grain. For more info on that, check out this video. Slice the beef into 1/4-inch thick slices against the grain. In a bowl, toss the beef with the cornstarch until evenly coated. Set aside. In a saucepan, heat 2 tsp. oil over medium-low heat. Add garlic and ginger to the pan and stir for about 15 seconds, then add soy sauce and water. Dissolve the brown sugar in the sauce and increase heat to medium. Bring sauce to a boil and simmer for about 2-3 minutes or until sauce is slightly thickened. Set aside. In a wok or skillet, heat 1/2 cup oil over medium heat. Cook slices of beef in oil in 2-3 batches for about 2 minutes each or until edges start to brown. 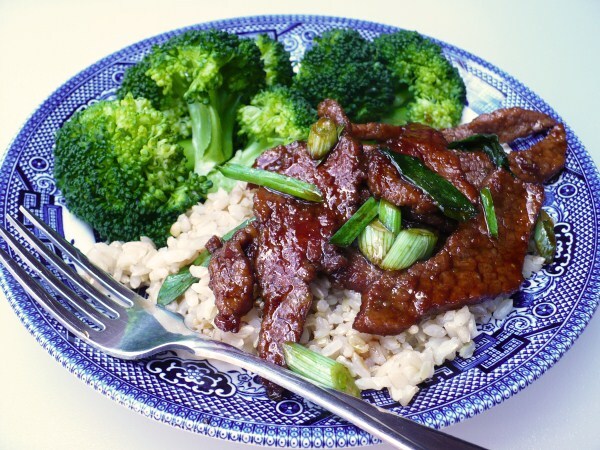 Remove beef with a slotted spoon to a paper towel-lined plate, then discard the oil from the wok or skillet. Return pan to heat and add the meat back into it; cook for 1 minute, stirring constantly. Add the sauce and cook for one minute more while stirring to coat. Add the green onions and cook for one more minute; remove from heat and serve over steamed rice. They're soft and chewy (and not dry). One batch makes a lot. They're just happy and cute! Have I convinced you to try these yet? Preheat oven to 375 degrees. Grease a 13x18-inch baking pan. In a large bowl, cream butter and sugar until light and fluffy. Add eggs, one at a time, mixing after each egg. Add vanilla and mix well. In a separate bowl, whisk together flour, salt, and baking soda; add slowly to egg mixture until thoroughly combined. Spread dough evenly in pan (I find this is easiest to do with damp hands - re-wetting as necessary). Bake for 10-15 minutes or until light golden brown and a toothpick comes out clean. Cool completely. Beat butter and shortening until smooth and creamy; add vanilla and salt. Alternate adding milk and powdered sugar until frosting is spreading consistency. 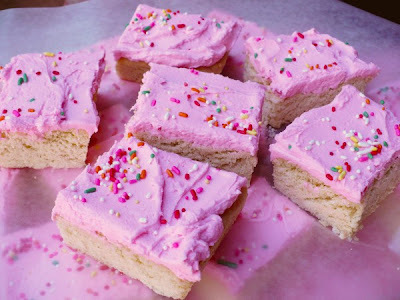 Add food coloring, if desired. Before frosting bars, use a knife and cut around inside edge of pan to loosen sides. Frost, then cut bars. I usually cut 5x8 for a total of 40 bars. I love fried chicken. I get cravings for it sometimes, though I usually don't indulge them. Mostly because the closest fried chicken place to me is Church's and I don't like theirs. I also don't like the mess involved when frying your own. I've spent a couple of years searching for a homemade, oven-fried version that is both crispy and flavorful (meaning it actually tastes like it's fried). I've found the recipe that works for me! I've made this a few times now and I can confirm it tastes like fried, but without all the fat and mess. You will most likely find it on either the top or bottom shelf of the cracker aisle in the grocery store. If you can't find it, bagel chips will also work. 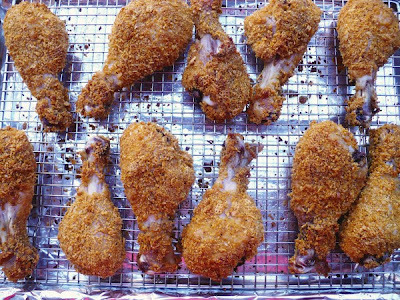 I like to use drumsticks for this recipe because they're usually cheap. I was able to coat 11 pieces with just one batch and probably could've done a few more. If you want to use other chicken pieces, that's fine. However, if you're using boneless chicken, it will cook a lot faster so you'll need to adjust your baking time accordingly. 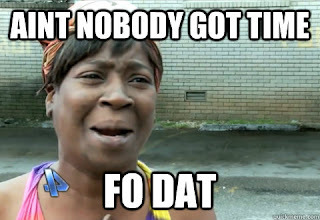 Preheat oven to 400 degrees. Set a wire rack in a foil lined baking sheet and spray with cooking spray. Finely grind the toasts and cereal together in a food processor. Transfer crumbs to a large gallon size plastic bag and add the salt, cayenne, paprika, and pepper. Add in the oil and shake to distribute. If using boneless, skinless chicken breasts or tenders, reduce baking time to 20-25 minutes. I first tried this out on St. Patrick's Day. We had corned beef and cabbage, but I wanted a more flavorful way to prepare the cabbage instead of just boiling it with the beef. A relative of mine pinned Martha Stewart's recipe for roasted cabbage and I thought, "Hey, that'll do!" But I was also making some roasted potatoes, so I needed a recipe that called for an oven temp of 425 instead of 400 so I could do them simultaneously. I found one on Food.com that worked. Essentially it's the same thing, just a decreased cooking time. This is my new favorite way to prepare cabbage. The flavor that comes from roasting and the browned edges is so good! And the olive oil makes the leaves so tender. 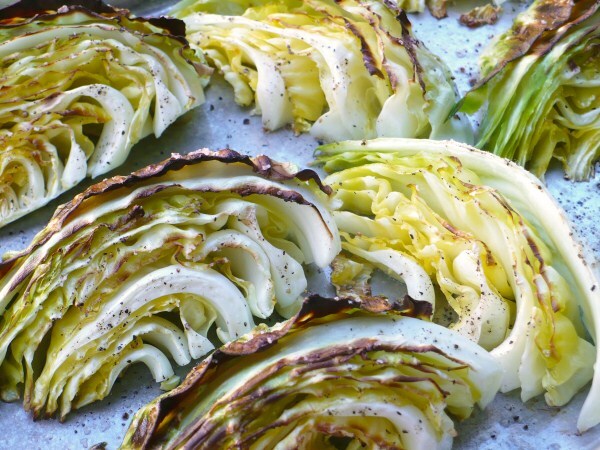 You can cut the cabbage into wedges like pictured above, or cut it into 1-inch thick rounds, as shown here. Preheat oven to 425 degrees. Brush a rimmed baking sheet with olive oil. Lay wedges or rounds flat on baking sheet and brush liberally with olive oil. Sprinkle with salt and pepper. Roast in oven for 25-35 minutes or until edges are browned and cabbage is tender. Alternatively, you can roast them at 400 degrees for 35-45 minutes. So I've been meaning to make these for a long time, ever since I saw them on The Girl Who Ate Everything. I had a rough week and a dear friend of mine brought me dinner one night. As a thank you, I decided it was time to make these cookies to share. They get a thumbs up from her family and mine! 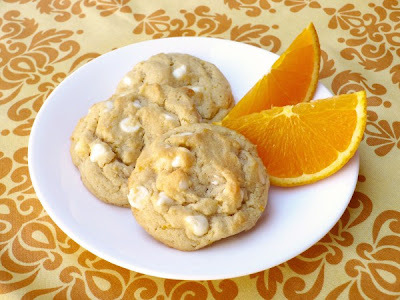 They are soft and chewy and have just the right amount of orange and vanilla flavor. A perfect spring time treat for the first day of May! Preheat oven to 375 degrees. In a small bowl, combine flour, baking soda, and salt; set aside. In a large bowl, cream butter and sugars until light and fluffy. Add egg and vanilla and beat until smooth. Gradually add flour mixture until thoroughly combined. Stir in orange zest and white chocolate chips. Drop by rounded teaspoonfuls (I used a medium cookie scoop) onto ungreased or parchment-lined cookie sheets. Bake for 8-10 minutes or until golden brown around edges - do not over bake! Let cookies cool on sheets for several minutes before transferring to a wire rack. I got 34 cookies out of one batch.